Instinctive shooting, casting your arrows towards your target without a bow sight, is definitely fun and fulfilling. It brings a challenge to your shooting that, once mastered, gives one of the best feelings in the world. However, long-distance shooting without a bow sight is very difficult and takes years of practice to master. Whether you’re planning on hunting or target shooting, it’s usually recommended to use the best bow sight you can afford. With that in mind, we’ve done the research for you and bring you the best bow sights for 2017. First, we’ll look at multi-pin bow sights. These have the distinct advantage of allowing you to set up your bow for shooting at various ranges without having to touch the sight before and after the shot. This is crucial when you’re hunting, since you can’t guarantee always getting a gorgeous 25-yard shot on an unpredictable buck. In multi-pin arrangements, here are the best bow sights for 2017. This sight has been a mainstay in the Spot Hogg lineup and for good reason. 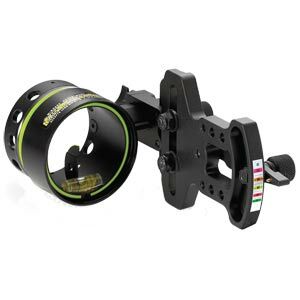 It is extremely adjustable and customizable due to its 2nd and 3rd axis adjustments. The Spott Hogg also features a generously long 6.5 inch dovetail mounting bar which allows your to find that sweet spot in which you can focus on the pins and the target the easiest. On top of the Spot Hogg Hogg It being tough as nails, once you have this sight set up, you’re all set. If for some chance you have to gang adjust the pins, you can take advantage of one of the industry’s best “no clamp” micro adjustment systems. You can totally customize the set up of your Spot Hogg Hogg-It. You can choose from 5 or 7 pins and arrange those pins in any size and color throughout the rack. Offered pin sizes are: 0.010, 0.019, and 0.029″. Top this bad boy off with an optic wrap and you’ll be set no matter what kind of light you have to shoot in. We shoot this sight and highly recommend it. Pin adjustment screws sometimes seize up due to corrosion/rust. To check the latest prices on the Spot Hogg Hogg-It Click here. The Axcel Armortech Pro is definitely a contender for best bow sight for 2017. The Axcel Armortech Pro features a micro adjustable dovetail bracket and offers 2nd and 3rd axis adjustments. You can choose from a 4, 5, or 7 pin setup which can include 0.010″, 0.019″, or 0.029″ sized fibers. To fight against vibration, the Axcel Armortech Pro features a Mathews Harmonic Damper if desired. Not visible in our picture, the Axcel Armortech Pro also features a Armor Fiber housing which is a housing that resulting in 100% fiber optic protection. 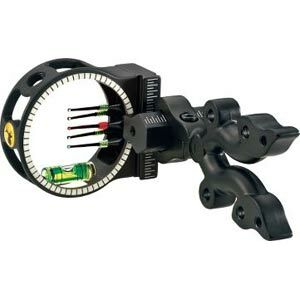 This sight offers micro gang adjustments as well as individual pin micro adjustments. We consider this sight to be one of the best multi pin bow sights for 2017. To check the latest prices on the Axcel Armortech Pro, click here. 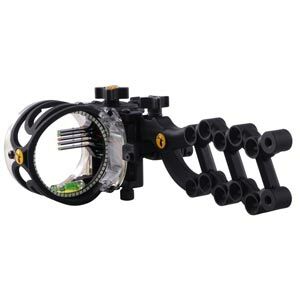 Trophy Ridge’s Punisher is one of the top-selling multi-pin bow sights, and for good reason. It’s inexpensive, but Trophy Ridge doesn’t sacrifice quality in making it soft on the wallet. It offers a design that’s sleek and modern, and offers plenty of value for the money. Unlike most sights in this price range, the Punisher is constructed of metal. That means it’s built to last, not be replaced every season. The sight is available with a rheostat light, but this proves to be the chink in the Punisher’s armor. The light is turned on and off by adjusting the lid on the battery compartment. This can prove to be a problem because once it’s loose enough to turn off the light, the lid easily spins the rest of the way off. I’ve lost a couple of batteries this way. Also, if you prefer ultra-thin pins, these are 0.029-inch fiber pins, which are a bit on the thicker side compared to other sights. To check the latest prices on the Trophy Ridge Punisher, click here. 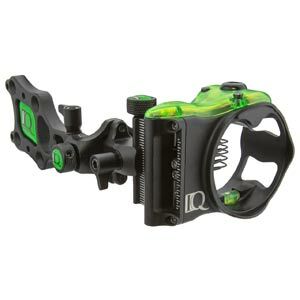 IQ Bowsights makes excellent products, and the Micro 5-Pin sight isn’t an exception to that rule. The built-in Retina Lock Technology helps you control your muscle memory, form, and consistency, which will lead to shooting tighter groups at longer distances. It almost instantly lets you know if you’ve adjusted your torque or anchor point. The fiber optic pins are thin, at 0.019 inch, but they’re highly visible. Unfortunately, there’s no rheostat light included. You have to buy that separately, which is disappointing for a sight at this price point. 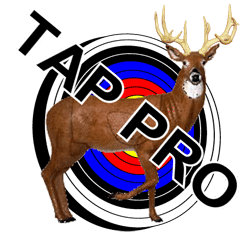 To check the latest prices on the Field Logic IQ Pro Bow Sight, click here. Now, we’ve got another Trophy Ridge 5-pin sight, the React. This sight is constructed from ballistic copolymer plastic, making it quite a bit lighter than comparable sights – 24 percent lighter, on average. It features a reversible mounting bracket, helping with higher and lower anchor points, and includes a rheostat light. The pins are easy to see, but thin enough (0.019-inch fiber optic) to offer plenty of sight between and around them. Unfortunately, the sight only comes with an instructional DVD, no printed manual. The product specifications don’t make it clear that you need to have a relatively fast-shooting bow for the sight to be accurate. To check the latest prices on the Trophy Ridge React Bow Sight, click here. Truglo is best known for inexpensive archery accessories, but they aren’t always of the highest quality. The Carbon XS 4-pin sight is a refreshing exception, offering tremendous value at a very low price point. The sight is constructed of carbon-composite materials, with a soft touch coating to protect it and offer a distinctive look. The extra-long fibers are easy to see, and the sight includes an integrated push-button light. Unfortunately, the pins are difficult to adjust because of the soft-touch coating; you have to loosen them almost all the way and then tap them into place. You also have to be careful not to overtighten the windage adjustment, or it will bend and lose accuracy. 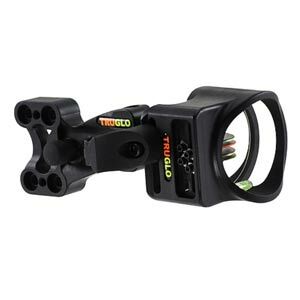 To check the latest prices on the Truglo Carbon XS sight, click here. Some archers prefer single-pin sights, even though they have to be adjusted in the field for different ranges. If you’re in that camp, let’s look at the best bow sights for those who prefer the single-pin variety. This is the top-selling single-pin adjustable sight on the market, and for good reason. It’s been around for years, and has features that set it apart from the competition. The elevation arm moves with silky smoothness, and it pairs with the industry’s most accurate sight tapes to provide you with unmatched performance in hunting or 3D shooting. The HHA Optimizer Lite features a 0.019-inch pin size, and tool-free windage and elevation adjustments that make tuning the sight a breeze. The only real drawback to this sight is that it doesn’t include a rheostat light. With so many great features and so few drawbacks, it’s no wonder this has been one of the best bow sights for so many years. To check the latest prices on the HHA Optimizer LIte, click here. Trophy Ridge makes great sights, and the Pursuit is one of them. This vertical single-pin adjustable sight has an easy-to-change elevation arm that might not move as smoothly as the HHA Optimizer Lite’s, but it is still simple to get it to just the right range. The Delrin bushings within create smooth, quiet movement without any metal-to-metal contact. The sight is lit with a rheostat light, so you can adjust the brightness to any lighting conditions. The glo indicator pin maintains your accuracy through changing and low light, and the 0.019-inch fiber optic pin provides precise accuracy. Unfortunately, the sight requires several Allen keys to adjust various parts of the sight, and there’s too much play in the adjustments. Getting an accurate sight-in is challenging, to say the least. To check the latest prices on the Trophy Ridge Pursuit bow sight, click here. 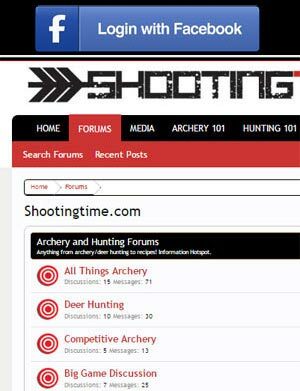 You’ll have no problem finding a good sight for your compound bow, if you look at the options we’ve provided here. There’s no such thing as a perfect sight, but we do have our distinct preferences. The selections we’ve found have strong advantages over the competition, but some are definitely better than others. The key is to research based on what you need, and choose accordingly. We’ve told you about the best bow sights, now it’s up to you to make a choice.